No. 1 on McNally Robinson's Best Seller List for Paperback Non-fiction September 2010! To order this book, contact ourdementiajourney@gmail.com. Janet Lewis Anderson, a native Winnipegger, grew up in a small, but loving family. Parents, Janette and John Lewis doted on their only child and so when it came time for them to leave this world, it was especially hard on Janet. As a way to deal with the stress of care-giving, especially for her Mother who was dying from Alzheimer’s disease, as well as the grief of saying goodbye to a parent, she began expressing her emotions via her keyboard. 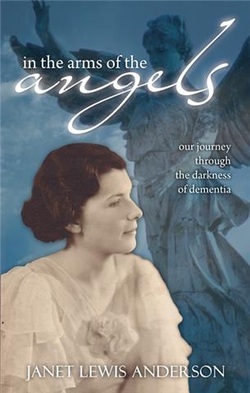 “In The Arms of The Angels” is a true Mother / Daughter love story and tribute to her late Mother. It basically chronicles the journey they travelled as they struggled with her Mother’s dementia and the effect of this disease on their lives. Although the book primarily addresses the hardships and emotional turmoil of dealing with Alzheimer’s disease, it is also about grief, losing a loved one and finding the strength to carry on. As the book came to life, an immense feeling of love and warmth has filled Janet’s heart. She is positive that her Mother’s spirit is present with her on this new journey. Now good tears and good emotions rush through her instead of emotions filled with grief and emptiness. She continues to have many Ah ha moments; moments of insight and revelation; moments of healing and gratitude. It’s is Janet’s sincere wish that her story will resonate and touch the hearts of her readers and that her book will be a source of compassion and inspiration for others who are travelling this difficult road.